王继龙, 吴中海, 张克旗, 孙玉军, 周游. 四川龙门山南段青衣江河流阶地形成时代及其构造地貌意义[J]. 地质通报, 2018, 37(6): 996-1005. Wang J L, Wu Z H, Zhang K Q, Sun Y J, Zhou Y. 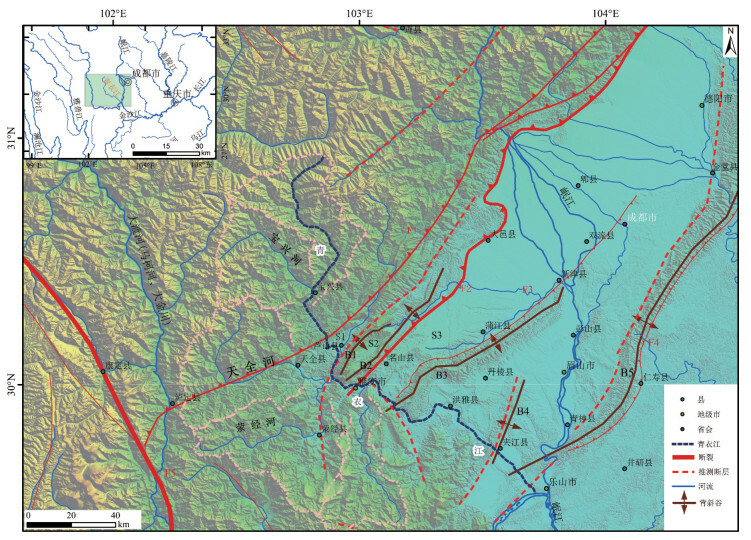 Formation age and its tectonic geomorphological significance of Qingyiji-ang River terraces in the southern of Longmenshan, Sichuan[J]. Geological Bulletin of China, 2018, 37(6): 996-1005. 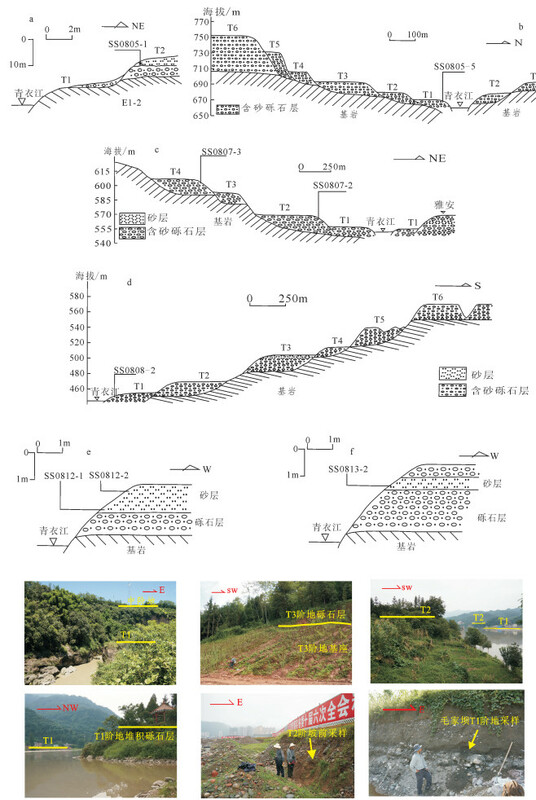 Abstract: The earth's surface survey found that, across the south part of the Longmen Mountain, Qingyijiang River has incised can-yon along the upstream section, and terrace development is more complete along the downstream section. The chronological test of low terrace in Qingyijiang River was carried out by the method of OSL dating, and the formation age of low terrace was obtained. 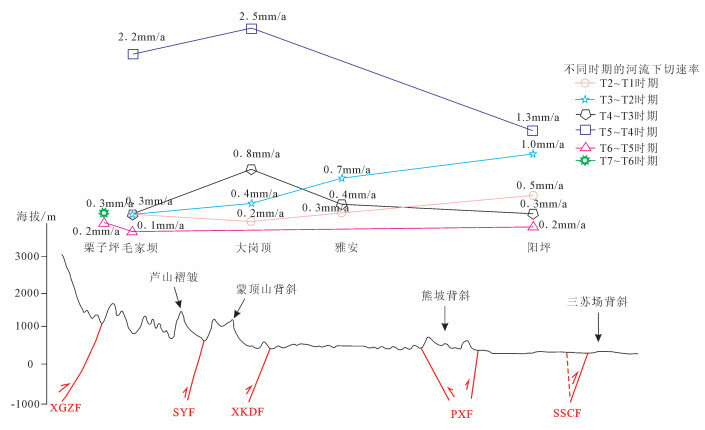 In combination with the systematic arrangement, comparison and analysis of the previous data and an analysis of the existing chronologi-cal data of the Qingyijiang River terrace, the authors found that the T1-T7 terrace in the middle and lower reaches of the Qingyi River was mainly formed at about 7.3～8.0ka, 40～50ka, 75～85ka, 129ka, 149ka, 270～300ka, 740ka. According to further inference from the results of the surface investigation, it is found that the present Qingyijiang River main channel already existed in the Middle Pleistocene and earlier. Therefore, the formation of the present Qingyijiang River resulted from the broken block tilting diversion or late river capture, which needs further research. In addition, the estimation of the age results of the geomorphic surface of the lower terrace of the Qingyijiang River shows that the crustal uplift rates of the Late Quaternary in different sections of the Qingyijiang River Valley in the south of Longmen Mountain are different. Since the Middle Pleistocene, the river incision rate of Lushan to Dagang-ding section has been significantly larger, which can probably be attributed to the geomorphic response of the Lushan seismogenic tec-tonics in the late Quaternary period. 苏鹏, 田勤俭, 梁朋, 等. 基于青衣江变形河流阶地研究龙门山断裂带南段的构造活动性[J]. 地震地质, 2016, 38(3): 523–545. 唐熊, 陶晓风. 雅安地区青衣江流域第四纪阶地特征分析[J]. 沉积学报, 2009, 27(1): 137–141. 张世民, 丁锐, 毛昌伟, 等. 青藏高原东缘龙门山山系构造隆起的地貌表现[J]. 第四纪研究, 2010, 30(4): 791–802. 贾营营, 付碧宏, 王岩, 等. 青藏高原东缘龙门山断裂带晚新生代构造地貌生长及水系响应[J]. 第四纪研究, 2010, 30(4): 825–836. Liu S, Zhang S, Ding R, et al. Upper crustal folding of the 2013 Lushan earthquake area in southern Longmen Shan, China, insights from Late Quaternary fluvial terraces[J]. Tectonophysics, 2015, 639(3): 99–108. 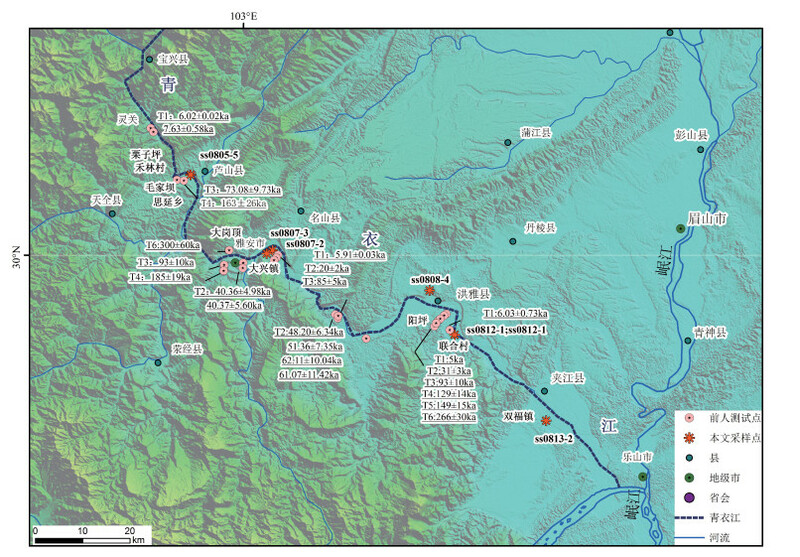 Jiang D, Zhang S, Li W. Research on the Quaternary fluvial geo-morphological surface sequence of the foreland region in southern Longmen Shan, eastern Tibet[J]. Geomorphology, 2016, 269: 133–148. DOI:10.1016/j.geomorph.2016.06.036. 王继龙, 吴中海, 孙玉军, 等. 青衣江河流沉积与阶地特征及其成因演化[J]. 地质力学学报, 2016, 22(3): 642–658. 袁俊杰, 陶晓风. 四川名山-丹棱地区青衣江流域的砾石层特征及水系演化[J]. 四川地质学报, 2008, 28(1): 6–12. 王刚, 陶晓风, 伊海生, 等. 四川盆地西南缘雅安-名山地区青衣江古河道的变迁及蒙顶山背斜的隆起[J]. 第四纪研究, 2010, 30(4): 779–790. 王二七, 孟庆任. 对龙门山中生代和新生代构造演化的讨论[J]. 中国科学:地球科学, 2008(10): 1221–1233. 田婷婷, 吴中海, 张克旗, 等. 第四纪主要定年方法及其在新构造与活动构造研究中的应用综述[J]. 地质力学学报, 2013, 19(3): 242–266. 张克旗, 吴中海, 吕同艳, 等. 光释光测年法——综述及进展[J]. 地质通报, 2015(1): 183–203. Godfrey Smith D I, Huntley D J, Chen W H. Optical dating stud-ies of quartz and feldspar sediment extracts[J]. Quaternary Science Reviews, 1988, 7(3): 373–380. Berger G W. Effectiveness of natural zeroing of the thermolumines-cence in sediments[J]. Journal of Geophysical Research, 1990, 95(B8): 12375–12397. DOI:10.1029/JB095iB08p12375. 周从政. 青衣江流域的水资源[J]. 四川水利, 2009, 30(1): 37–39. 李勇, 周荣军, Densmore A L, 等. 青藏高原东缘龙门山晚新生代走滑-逆冲作用的地貌标志[J]. 第四纪研究, 2006, 26(1): 40–51. 张显林. 青衣江中上游流域水文特征[J]. 四川水力发电, 1991(1): 39–42. 李勇, 曾允孚. 龙门山逆冲推覆作用的地层标识[J]. 成都理工大学学报(自科版), 1995(2): 1–10. Burchfiel B C, Chen L, Liu Y P, et al. Tectonics of the Longmen Shan and Adjacent Regions, Central China[J]. International Geolo-gy Review, 1995, 37(8): 661–735. DOI:10.1080/00206819509465424. 邓起东, 陈社发, 赵小麟. 龙门山及其邻区的构造和地震活动及动力学[J]. 地震地质, 1994, 16(4): 389–403. 李智武, 刘树根, 陈洪德, 等. 龙门山冲断带分段-分带性构造格局及其差异变形特征[J]. 成都理工大学学报(自然科学版), 2008, 35(4): 440–454. 李勇, 周荣军, 赵国华, 等. 龙门山前缘的芦山地震与逆冲-滑脱褶皱作用[J]. 成都理工大学学报(自科版), 2013, 40(4): 353–363. 马晓雪, 吴中海, 李家存, 等. 龙门山构造带南段向西南延伸的遥感影像证据及地震地质意义[J]. 地质力学学报, 2016(3): 548–567. 刘韶, 张世民, 丁锐, 等. 青衣江中游晚第四纪河流阶地构造变形特征与芦山地震成因分析[J]. 地壳构造与地壳应力文集, 2014: 35–49. 梁明剑, 郭红梅, 李大虎, 等. 2013年四川芦山7.0级地震发震构造机理及青衣江上游流域地貌的响应[J]. 地学前缘, 2013, 20(6): 21–28. Godard V, Lavé J, Carcaillet J, et al. Spatial distribution of denuda-tion in Eastern Tibet and regressive erosion of plateau margins[J]. Tectonophysics, 2010, 491(1): 253–274. 崔志强, 刘登忠, 孟庆敏. 川西凹陷地区更新统砾石层沉积成因探讨[J]. 中国地质, 2009, 36(5): 1065–1078. 王旭龙, 卢演俦, 李晓妮. 细颗粒石英光释光测年:简单多片再生法[J]. 地震地质, 2005, 27(4): 615–623. Wang X, Lu Y, Zhao H. On the performances of the single-ali-quot regenerative-dose (SAR) protocol for Chinese loess:fine quartz and polymineralgrains[J]. Radiation Measurements, 2006, 41(1): 1–8. DOI:10.1016/j.radmeas.2005.02.010. Durcan J A, King G E, Duller G A T. DRAC:Dose Rate and Age Calculator for trapped charge dating[J]. Quaternary Geochronolo-gy, 2015, 28: 54–61. DOI:10.1016/j.quageo.2015.03.012. 徐锡伟, 闻学泽, 韩竹军, 等. 四川芦山7.0级强震:一次典型的盲逆断层型地震[J]. 科学通报, 2013, 58(20): 1887–1893. ① 成都地质学院. 1:5万区域地质调查队 1989—1991年实测天全幅 地质图. 1989-1991.